Palak Gosht or meat cooked in spinach gravy is an excellent comfort food served with rotis parathas or nan with a dollop of butter. It’s a delicious home style dish made popular by restaurants all across, Palak Gosht is a simple dish to cook and it looks extremely appetizing. 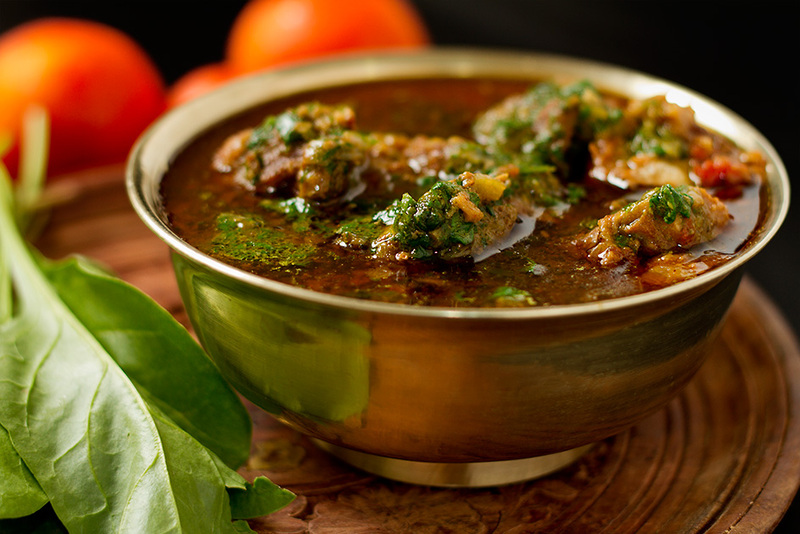 While spinach is cooked with meat in several cuisines as a stew, this particular recipe of cooking mutton or any meat with spinach is from the Punjab region of India and Pakistan, a land where fields are full of wheat, rice, corn, mustard, tomatoes and several vegetables where it is called as “Palak Gosht”. Meats like Beef and mutton (goat meat) are cooked along with freshly ground spices in spinach gravy giving it a rich colour and delicious taste. If you don’t have time to marinade the meat, add the ginger, garlic and green chilies after step 4. Fry them well, add meat and fry the meat till it becomes brown. After the meat browns, add the yogurt, fry for about 3-4 minutes and continue with step 5. The cartoon character Popeye the Sailor Man is portrayed as having a strong affinity for spinach, becoming physically stronger after consuming it. While the portrayal of Popeye was based on faulty calculations of iron content in Spinach, it still is one of the healthiest greens. the United States Department of Agriculture states that a 180-g serving of boiled spinach contains 6.43 mg of iron as opposed to a 170-g ground hamburger patty which contains at most 4.42 mg of iron. Spinach has a high nutritional value, especially when fresh, frozen, steamed, or quickly boiled. It is a rich source of the Daily Value, of vitamin A, vitamin C, vitamin K, magnesium, manganese, and folate. Spinach is a good source of the B vitamins riboflavin and vitamin B6, vitamin E, calcium, potassium, and dietary fiber. Clean and wash the meat. Puree ginger, garlic and green chilies along with yogurt in a blender. Add 1/4 tsp cumin powder. Marinate the meat in this mixture for about an hour. Blanche the spinach in boiling water along with 1/2 Tsp salt for about a minute, drain and puree the spinach. Heat oil in a pressure pan, add bay leaves, black cardamom and cloves. When the leaves begin to fry, add onions and fry till they are well browned. Add coriander powder and saute for a few seconds, add cumin powder and 2-3 tbsp of water, reduce the flame and allow the spices to get fried. When the oil begins to separate, add the meat along with the marinade and stir well. Keep the gas flame on high and cook till the marinade reduces and oil starts to surface. Add tomatoes and continue stirring. After the marinade is mostly absorbed in the mutton, add salt, 2 cups of water and close the lid of the pressure pan. Reduce the flame to minimum after one whistle and let it cook on low heat. Switch off the gas after 25 minutes. Open the pan after the pressure drops on it's own, check for the doneness of meat. If the meat is falling off the bones, it is cooked. Keep the flame to lowest and add most of the pureed spinach, give the curry a good mix and cook uncovered till the oil surfaces. Just before serving swirl some of the pureed spinach and a knob of butter (optional). Serve this home style Palak Gosht with hot rotis, parathas or nan with a dallop of home-made butter. Tried this…delicious. Looking forward to cook some more of your recipes!